Safety - L.J. KEEFE CO.
L.J. 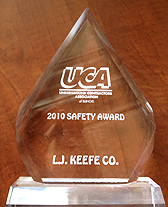 Keefe Co. (Keefe) believes that safety is a core value which has been critical to the long term success of the company. Proactive practices and continuing education for employees are key components of Keefe's Safety Program. Keefe also feels that promoting safe practices throughout the construction industry is very important. Over the past 30 years, Larry Keefe Sr. has spent countless hours advancing safety awareness and education for contractors and their employees. As examples, Mr. Keefe was instrumental in the creation of the Chicagoland Safety Council (CCSC) and the forming of a strategic alliance between the Occupational Safety and Health Administration (OSHA) and the Underground Contractors Association of Illinois (UCA).